This year, New Yorkers were treated with a double dip of EDM fun for Memorial Day Weekend. Returning vets Insomiac Events brought the action-packed Electric Daisy Carnival back to the five boroughs, while popular European festival Mysteryland made its USA debut just 100 miles north in Bethel Woods, New York. The clash of two titans on the same weekend sent the New York EDM world buzzing upon first announcement, and for the past week the #EDCNY and #MLUSA hashtags have created a festival battle on social media. Now that MDW has come to a close, is there a clear winner? Let’s take a look at how each festival fared. EDC has had a nurturing home in New York for several years now. After last year’s successful show at Citi Field in Corona, Queens, EDC returned to the fan favorite venue MetLife Stadium in East Rutherford, New Jersey, where EDC NY last had a home in 2012. Now that the weekend is a wrap, it is safe to say that EDC was once again a massive success. Crowds of approximately 50,000 people came through the gates of the Meadowlands Sports Complex for Saturday and Sunday to see world-class DJ’s do their thing on the decks, experience carnival attractions, and celebrate the holiday weekend with their raver friends. The positive vibes were once again in full effect, and the PLUR values were radiating through the atmosphere. Artists like 3LAU and Alvaro got crowds pumped up with energizing sets, and headliners like Hardwell, Afrojack, Tiesto, and Calvin Harris helped things go out with a mighty bang. And at the end of the day, it is great seeing that there’s no negative press about the festival to wake up to. Let’s keep our fingers crossed this will be the case of Electric Zoo in a few months. I attended EDC on Saturday, and for the second year in a row I had a blast and will definitely be returning next year. Across the pond, there is Mysteryland, a festival so massive us Americans couldn’t even imagine. Luckily for us, however, the festival organizers brought that experience to us for the first time. The debut American version of the festival took place at Bethel Woods in upstate New York this weekend. The venue is the home of the legendary grounds of Woodstock. This was also the first time since Woodstock that camping was permitted at the venue. This festival, however, isn’t a fair comparison to EDC New York. Besides including camping, Mysteryland USA was a three-day festival with a superstar lineup including Kaskade, Nicky Romero, and Moby. It would be more realistic to compare the grandiosity of Mysteryland USA to Electric Daisy Carnival’s main festival in Las Vegas or even to Electric Zoo Festival on Randall’s Island Park. In comparison, EDC’s New York festival is a smaller subsidiary and is branded as ‘On the Road to Vegas’. About 20,000 people attended Mysteryland this weekend, and many were excited to be a part of a historical concert legacy. Some concert-goers even believe that EDM fans are the hippies of this generation, making this festival fitting to continue Woodstock’s legacy. Unfortunately it wasn’t all positive news, as local police released details about several drug possession arrests at the festival. Despite this setback, it seems a good time was had by many, and something like this will leave special and unforgettable memories in these festival-goers’ hearts for years to come. 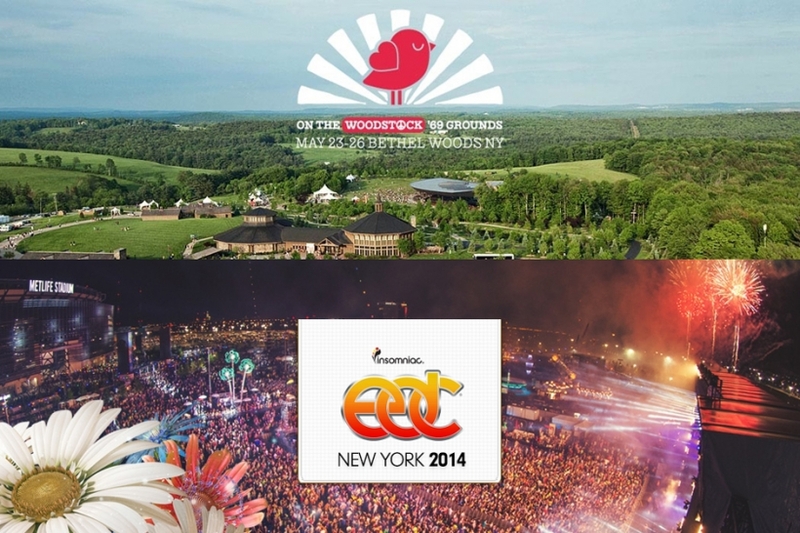 EDCNY vs MLUSA… the winner? EDC and Mysteryland have their own positives and negatives. Fans went to the festival that fit their needs best. Some wanted camping, and some had fun with the daily journey. Some wanted three days, and some were ready to rest on the third day. Some wanted that rural feel with a musical legacy, and some wanted that local, New York City environment and clubbing after-parties. Regardless of what you and your friends were going for, it has got to be said that an amazing time was had by all, and positive vibes were spread throughout the EDM community of the New York area. Kudos to both festival organizers for putting on two hella good shows this holiday weekend. It would be nice to see both return to the area next year. This wasn’t a competition at all. It actually helped the music scene find more awareness in the long run. With few to no negative press stories, we can hope that other people will begin to see festivals in a more positive light. Knock on wood that this progress will continue with Electric Zoo at summer’s end. In the meantime, it’s safe to say there is no clear winner in this situation, and neither EDC nor Mysteryland lost here. It was a great weekend, and that is truly awesome. EDM Assassin officially ends any social media wars and any hashtag competition. We’re all just sharing the love and throwing our hands in the air for the official start of summer!